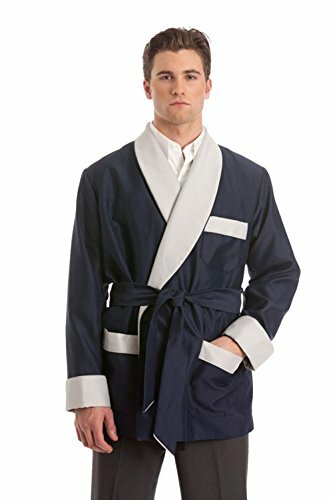 Classic & luxurious blue light weight smoking jacket made of fine satin material. The shawl collar, three exterior pocket flaps, turn-up cuffs and belt are made from grey satin. There are two interior pockets, one divided in half for storage of two cigars, and the other is a regular sized chest pocket. The wrap style smoking jacket closes with a grey tie belt. Mid-thigh length jacket is fully lined with satin. This smoking jacket is classically elegant and is perfect for all your warmer seasons. If you have any questions about this product by Duke & Digham, contact us by completing and submitting the form below. If you are looking for a specif part number, please include it with your message.